This photo was taken from a classroom in Academic Hall, looking toward downtown. The objects sticking up above the skyline are the phone company’s microwave towers. In the Old Days before optic cables, a lot of the country’s long distance traffic was beamed from point to point using these towers. Almost all of them have been decommissioned now. I don’t know if this was the classroom where I took speech under Fred Goodwin, who also produced winning debate teams. The assignment was to give a speech where you demonstrate something. I walked into class with my camera, proceeded to shoot pictures of everyone, then developed the roll of film standing in front of the classroom. Mr. Goodwin said it was a good effort, but didn’t come close to a demonstration he had in his early teaching days. The student was a former paratrooper who gave a speech on what it was like to jump out of a plane. In conclusion, he walked to the window, threw open the sash, perched briefly on the window sill, did a tuck and roll and disappeared from sight. Mr. Goodwin said he could see his career perishing along with his student. After a moment of stunned silence, the whole class, including the instructor, made a dash to the window, where they saw the student beaming up at them. He didn’t say what grade the student earned. Oh, those were the days, taking classes in Academic Hall! Would you like to hear about my speech to instruct for Mr. Goodwin? I’m almost ashamed to share it, but I did get an “A” on it, I think. It was my freshman year, and I had bought a tiny, painted turtle (real) for my brother Mark. 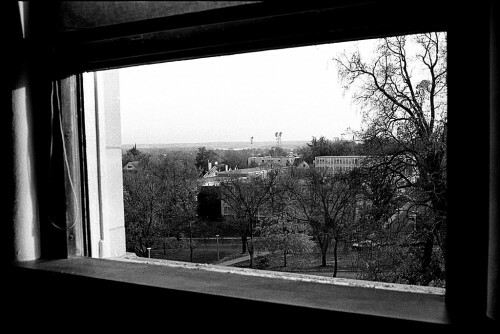 I was keeping it in the dorm, and, as I wracked my brain for a speech topic, I watched the little turtle sun itself in my big wide window at Leming Hall. In desperation, I used the turtle as the subject of my speech. Mr. Goodman said afterwards that I had taken “a nickel topic and made a dollar speech”! Looking back, I’m amazed that a professor of his stature agreed to teach freshman speech, but he never talked down to us, and he had such enthusiasm! Speaking of Leming Hall, do you have any photos of that wonderful old building before they tore it down to build the University Center? Ken — It’s a little bit painful for some of us who are seniors to hear the era of the microwave towers referred to as “The Old Days.” I recall the construction of the microwave network and the towers in Cape as a great leap forward in technology. The “Old Days” were when you picked up the telephone in Cape, it was a party line and a lady said “Central.” You also had to make a reservation in advance to call St. Louis or any place long distance because the wires could carry so little traffic. I love to read through the old ads and see Cape businesses with two-digit phone numbers. Or numbers with a letter after them, which I assume to be ring codes for party lines. We thought we were special when I was growing up to be on a two-party line, instead of sharing with four or six families. Thanks for backing me up on this one. Some days it’s hard to tell if a story I remember is history or imagination. Mr. Goodwin had a whole raft of those speeches gone wrong. One of the assignments was to use a startling statement as an opener. A student got up, paced slowly around the room until he came to a coed in the front row, leaned down and issued a plaster-cracking scream. She promptly threw up on his shoes. I guess he got a good grade for eliciting a response. In the good ol’ days we used smoke signals! You had FIRE back in those days?